Only a handful of these cards were ever made, perhaps as few as 20. The CrossLink is a bridgeboard with a difference, unlike most other bridgeboards, this card is not an emulator but actually makes the ISA slots found in most big box Amiga's active. That is, you can use real ISA cards on the Amiga, providing that there is a driver available and they don't use DMA. Unfortunately the ISA specifications requires a real X86 processor in order to do DMA, which obviously the Amiga does not have. It also contains an IDE hard drive interface and two serial ports on board. 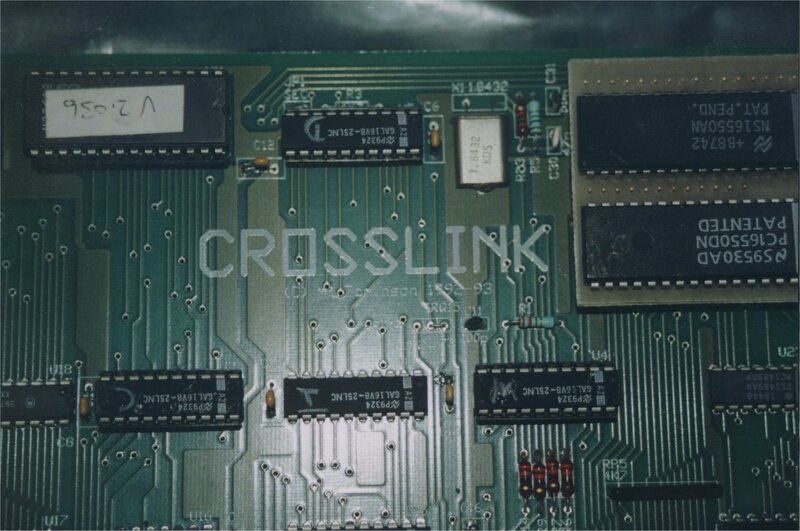 Real ISA cards can also be used under the software PC emulator called CrossPC. - 8 and 16 bit access to the 1K I/O and 1M memory space. - Wait states for slow boards. - system clock and 14MHz clock. - Full interrupt support with custom on-board interrupt controller. - Only uses 64K Amiga memory space. Doesn't reduce the amount of memory you can add to your Amiga. The device driver for the IDE interface (xlide.device) is in the ROM on the card. - Supports two controllers with a maximum of two drives per controller. Jumpers are available to change the drive to the secondary address. JP1 changes the address, JP2 and JP3 control the interrupt number to use. As shipped, the onboard controller is set to the secondary address and IRQ15. This allows a standard IDE or MFM/RLL controller to be plugged into the bus without any changes made. For reference, the IDE port uses addresses $1F0-$1F7. The secondary port uses addresses $170-$177. The drives on the onboard controller are unit numbers 0 and 1. A plug-in card at the primary address appears at units 2 and 3. Most IDE drives can support multiple sector transfers, which can speed up drive performance. A utility "setmult" has been provided to enable this mode of transfer. Simply put "setmult " somewhere in yourstartup-sequence to enable this. MFM/RLL controllers and some older IDE drives don't support this, and an error will be returned from setmult. A good high speed IDE drive can achieve better than 1.5MB/sec transfer rate with multiple transfers enabled. - Two serial ports can be added simply by plugging in two 8250, 16450 or 16550A UART chips. - Automatically detects 16550A's and uses their FIFO's. - Emulates the serial.device protocol with xlser.device. - Currently can drive 10 serial ports simultaneously. (*) These numbers are recommended numbers only. As stated above, the device driver automatically detects which interrupts the ports are connected to. Units 0 and 1 are hardwired, however. If you have a PC card which does not let you set the interrupts uniquely, then you will be unable to use those two serial ports simultaneously. Drivers for the NE1000 and NE2000 compatible cards are in the devs directory on the disk. Please note that these drivers are SANA-II drivers, and will work with applications such as AmiTCP. At least Workbench 2.04 is required in order to use these drivers.